Stand back. This delicious dish is not only obnoxiously nutritious, it is incredibly versatile. It can be a meatless main dish, a savory side dish, a cold leftover lunch. But one thing is for sure…any way it is served, it is bound to be terrific! Lovely vegetables, cut and ready to roast! tomatoes, red and yellow bell peppers, fresh green beans, a zucchini, and a handful of chopped green onions. I chopped them up and sprinkled them with olive oil, a bit of balsamic vinegar, salt and some freshly ground black pepper. By the way, in case you haven’t noticed, I love vinegar! I find any excuse to use it! If you are not a fan, you can leave it off. This quinoa is a tri color blend of the heirloom variety. Cooked in 15 minutes! Love that! 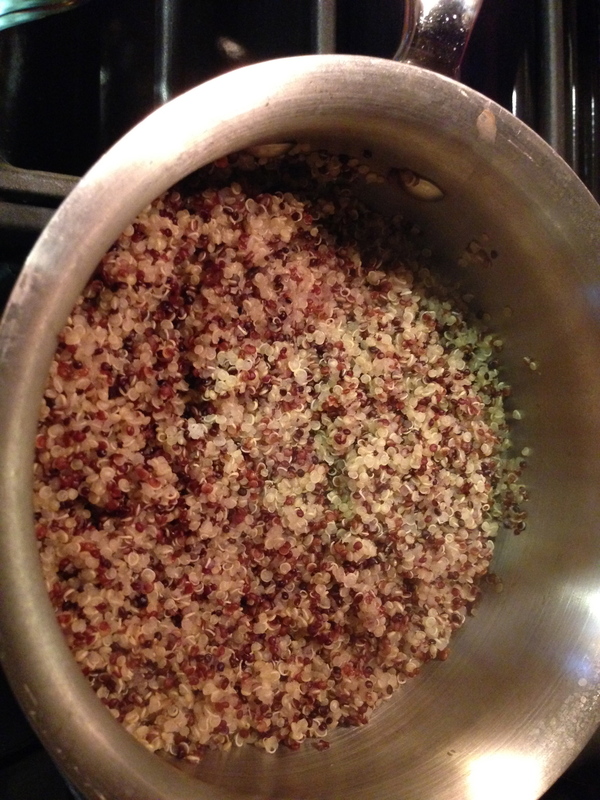 quinoa (start with one cup) and two parts water or broth (2 cups) into a sauce pan over medium high heat. Bring this to a boil, cover, turn the heat down and let simmer for about 15 minutes…then its ready to go. 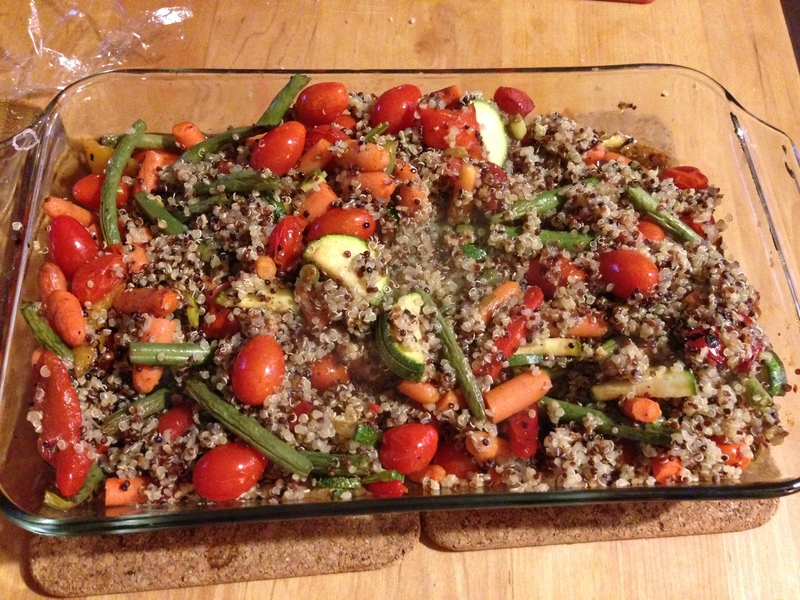 When the veggies came out of the oven, I added more fresh ground black pepper,ground on top, added the quinoa, gave it a stir and took it to the table. The ooohhs and aahhhs as it came to the table spoke volumes! The mmmm’s that followed the first forkful finished telling the story. Success. Try this for a nutrition packed addition to your regular side dish repertoire. Personalize it for your own taste and enjoy! Bon appetite! The final dish! 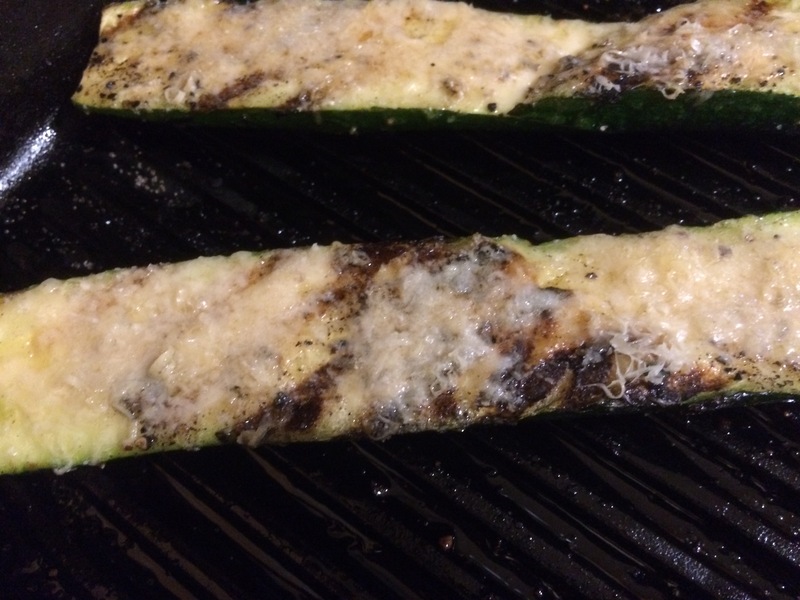 If you are in a garnishing mood, sprinkle this with feta or goat cheese before serving. 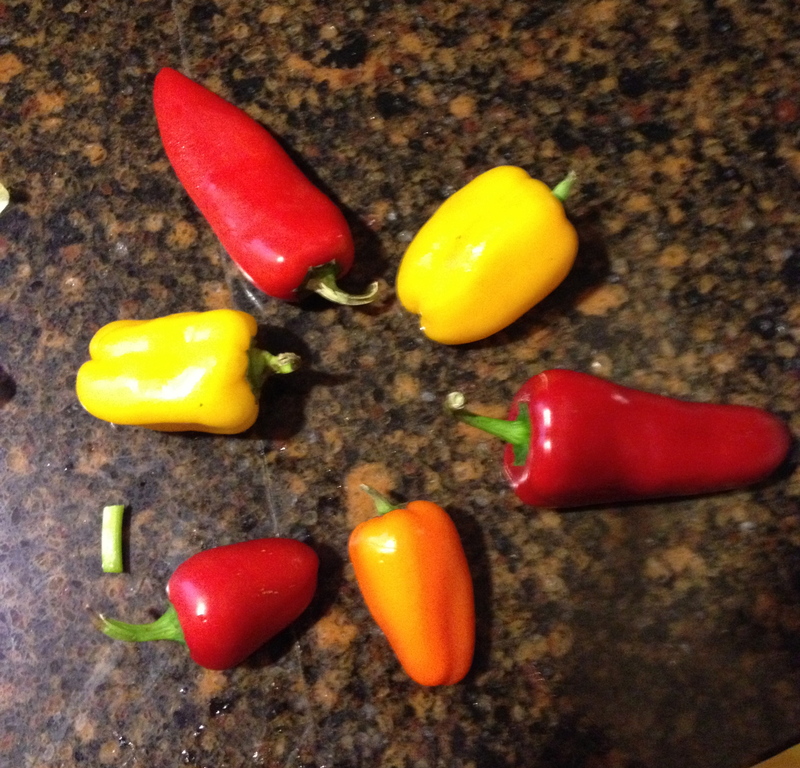 Baby peppers! Perfect for roasting! Yum! Tonight I made pasta for dinner. I roasted the sauce. Yes, that’s right. And it was fabulous. Absolutely fabulous! Here we go. 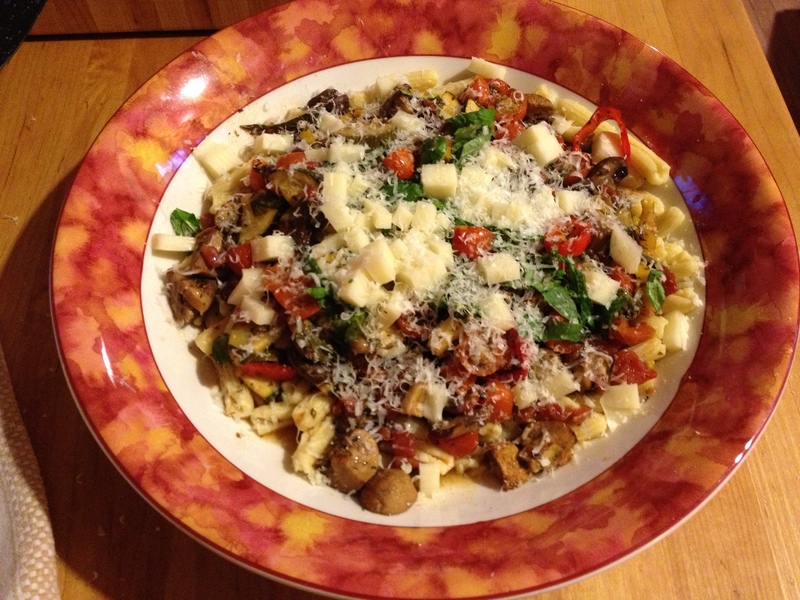 I had a taste for pasta Primavera. A Primavera sauce is a vegetable sauce usually associated with fresh, or seasonal, chunky cut vegetables. I wanted a light supper. Nothing heavy and fatty. I needed bright, light, and colorful. Something not only packed with flavor, but loaded with beneficial nutrients too. And as you know, I love to use what i have on hand. That is my creativity springboard. For some reason, that absolutely energizes me. I started pulling vegetables out of the fridge and pantry. For a special flavor twist, I decided to roast my sauce instead of cooking it on the stove top. 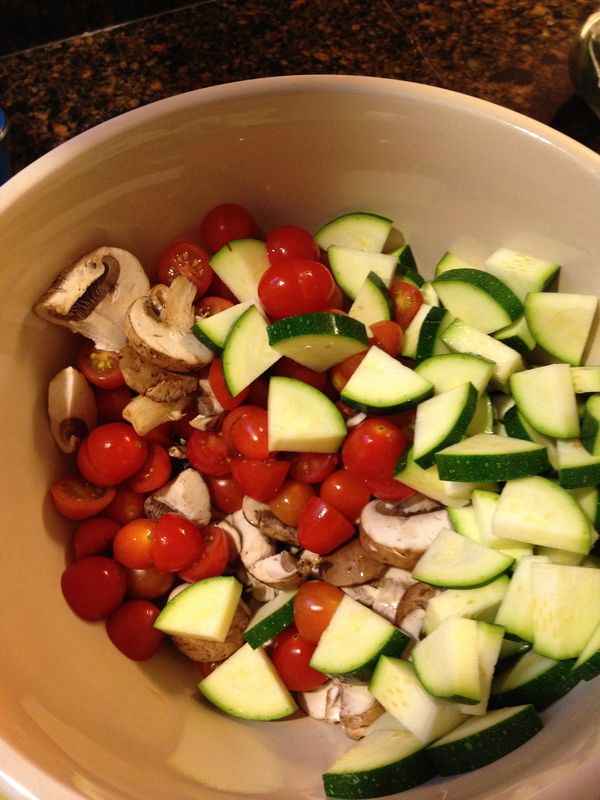 I cut up my veggies and dumped them into a big mixing bowl. Next I sprinkled them with pepper, both red and black, salt, herb de Provence, olive oil, and a tiny drizzle of balsamic vinegar. A good starting point. Chunky chopped vegetables! Next, I gave the mixture a good minute of stirring with a big wooden spoon. 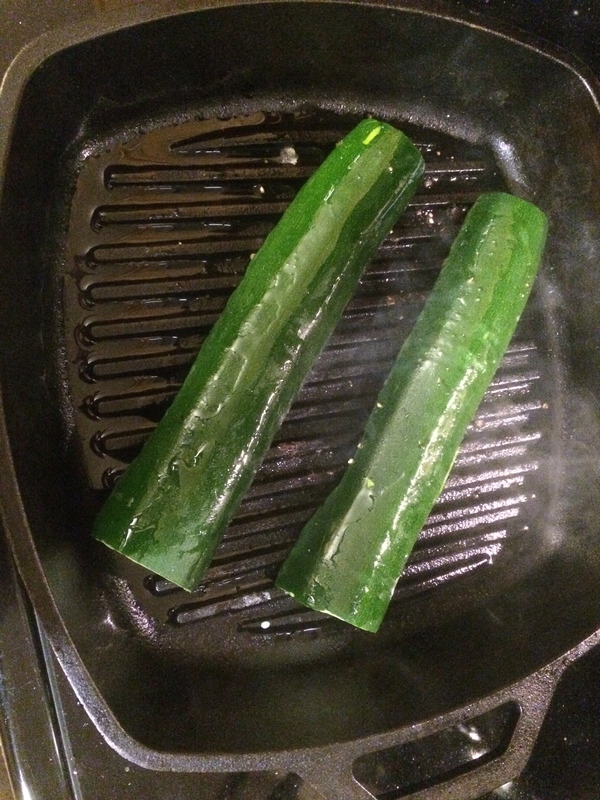 Then I put it into a glass roasting pan that was about 2″ deep. 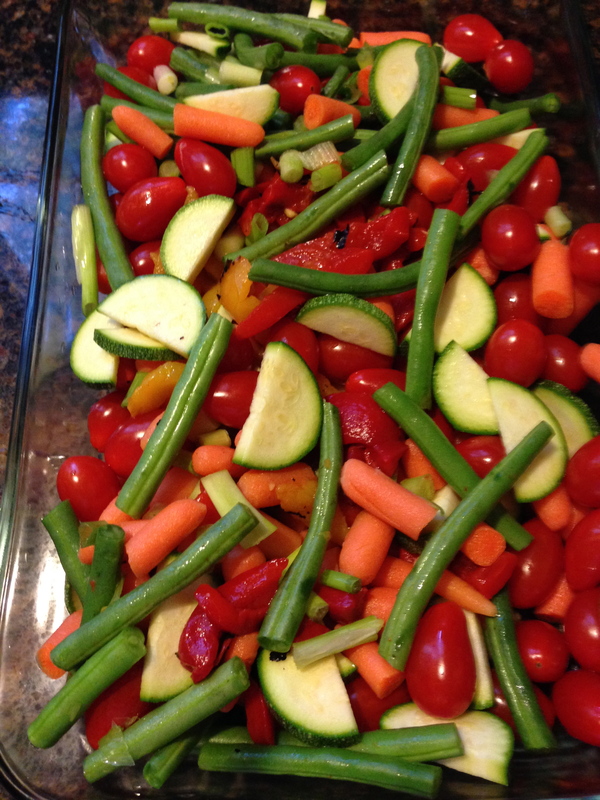 I sprinkled the vegetables with a little more salt and pepper, and tossed the pan into a preheated 375 degree oven. In the meantime, Denis popped open a bottle of wine. We sipped a glass of a yummy big bold red, and chatted with my son a bit. The boys set the table. I put a pot of water on to boil for the pasta. We had fresh pasta that was in the freezer, and that cooks pretty quickly. 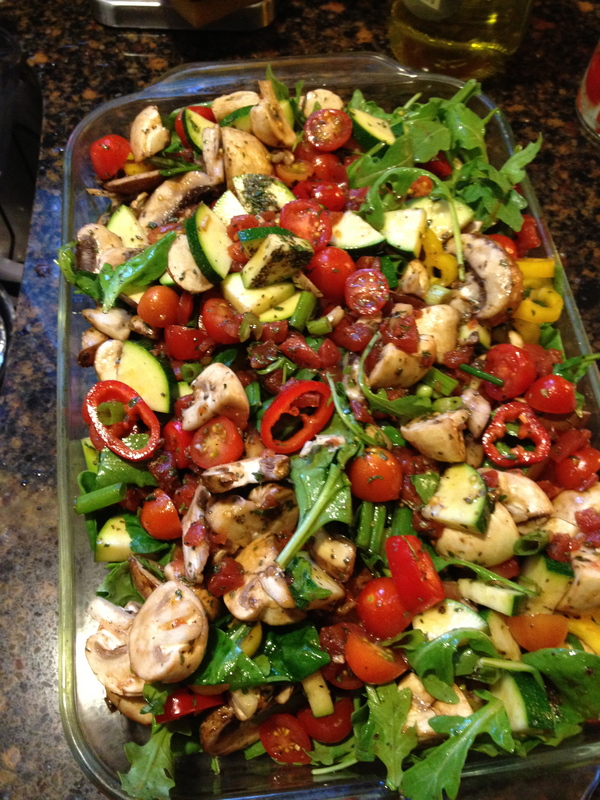 In 30 minutes, I pulled the veggies out of the oven. They had cooked down, so there was a good bit of what my grandmother called “vegetable liquor” in the pan. There was just enough liquid for a perfect sauce. I poured it over the cooked pasta, and voila! A super yummy light dinner was ready. Onto the table it went with some crusty bread. It was a colorful healthy vegetarian dinner. 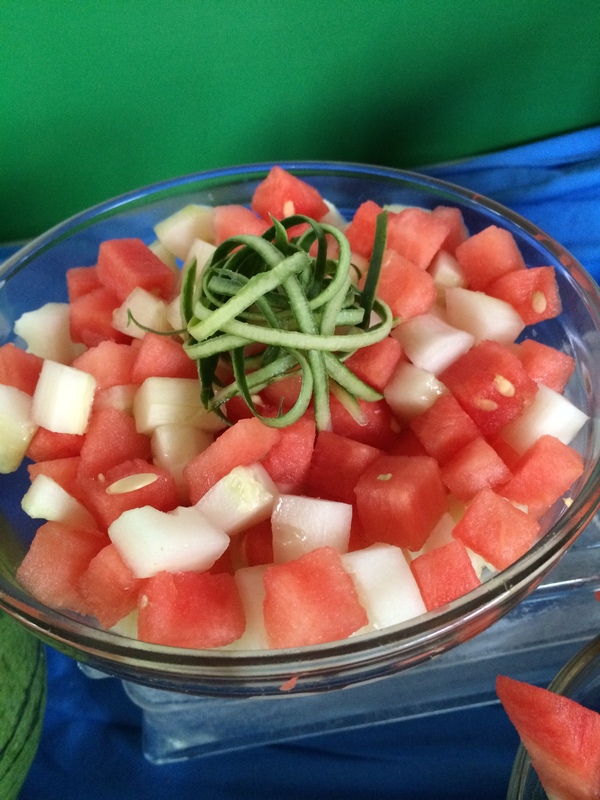 I am sharing my recipe with you, but customize it using your own palate as a flavor compass. Mix together in large mixing bowl. Add salt, pepper, red pepper flakes, olive oil, balsamic vinegar, Herb de Provence and any seasoning to taste. Toss this on the table for an incredibly mouthwatering meal loaded with flavor and packed with antioxidants and nutrients! The great thing about this recipe is that it can be totally customized. I am a moody garnisher. Sometimes I do it, sometimes I don’t. It depends on the flow of my day and, as always, time allowed. Sometimes my creative juices and energy match, other times I just need to get something, anything, on the table. But with this beautiful bounty of vegetables, my creativity ran wild, and I garnished with chunks of creamy mozzarella cheese, some shredded zippy parmesan cheese, and fresh from the garden basil with a chiffonade cut. It was simply wonderful! This is the dish headed to the table. Pasta with roasted sauce. Super Yum!